Featuring a spacious two stateroom / two head layout with separate midships stateroom with its own private head/shower and changing area. Main salon boasts generous headroom, full service galley with stand up refrigerator/freezer, curved dinette to port with high gloss cherry wood table to match the cabinetry. 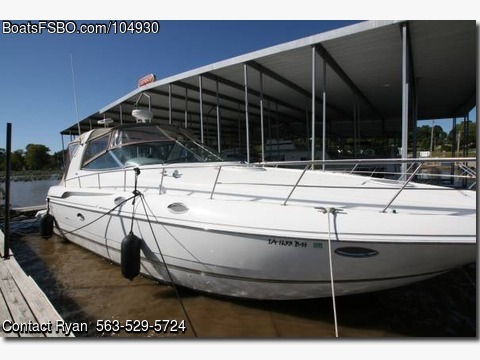 Powered by twin Mercruiser 8.1 FWC Horizon inboards with 420hp each and just approximately 450 original hours. Exterior layout features a walk-through windshield for easy line handling, L-shaped lounge adjacent to helm, wet-bar U-shaped seating with removable cocktail table, and outstanding engine access. Extended swim platform with swim ladder, cockpit cover, and transom storage locker. Camper Canvas and upholstery are both newer.